DC Towers predicted that the Romans would lose this past weekend but they proved us wrong! Taking on last week’s number one Manchester Titans they dispatched their foes 30-14. 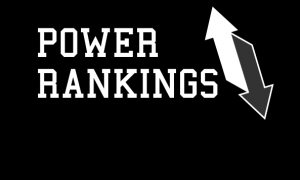 We did also say that Chester could be dark horses in the division after going to the playoffs with a number of rookies last year but we certainly didn’t see them being atop our Power Rankings at this point in the season. Congratulations Chester Romans! Whilst meaning no disrespect to the Essex Spartans or the Maidstone Pumas, the Bedfordshire Blue Raiders have been lower on our Power Rankings due to the quality of opposition faced, until this past weekend. They took on the highflying Watford Cheetahs, away from home too, and beat them 19-16 in a back and forth game. The Blue Raiders have been knocking on the door the past few years, but has their progression this offseason finally pushed them into playoff contention? I’d say so. The Thrashers’ only game of the season thus far is a 24-6 beating of the former Premiership Farnham Knights. Whilst the Knights have been uninspiring to say the least this season it is still a great start to the year for the rebranded Solent side. The Gladiators have quietly dispatched a couple of opponents so far this year, beating the Exiles 34-12 last week and taking out the Milton Keynes Pathfinders 19-8 this past Sunday. The question is will they be able to keep their undefeated status, and their place on our Power Rankings, over the next few weeks with tough games against the Cheetahs and Blue Raiders approaching? A two place rise for the Nighthawks due to the fall of others. They didn’t have a game this week but the 39-7 victory over the Shropshire Revolution is still fresh in the mind. Lincolnshire and Crewe are their next two games before they host Chester in what is sure to be a lively game. of the most experienced in the UK and well up to the job. I don’t think anybody expected a 0-0 draw from the Tigers-Senators game but it keeps both teams on our Power Rankings for another week. Up next the Tigers travel to the Edinburgh Wolves. A steep fall for the previously undefeated Titans after their slip up against the Romans. Had a touch of complacency kicked in? Doubtful with this hard working team but we must remember that the Titans are still a youthful and relatively inexperienced team since the complete revamp they’ve had the last couple of seasons. They’ll be back from this blip and certainly challenge the top come the end of the year. The Presidents are sitting pretty atop the National Division North after victory in their only game so far this year. 31-20 against the Edinburgh Wolves isn’t a bad result but the Presidents will no doubt want to improve on that and have the ability to do so. The Centurions opened their campaign by knocking off the previously undefeated Bristol Apache 30-18. They have to wait a fortnight before they take on the number 3 Solent Thrashers, so the training session in between will be crucial as to whether Gloucester gets a result and stays here or not. Note on Oxford Saints – the Saints were at number 4 in our Power Rankings last week and won at the weekend. However their win was an unconvincing 9-7 victory over bottom of the table Bournemouth and thus DC Towers has gauged that player and coaching losses at the Saints have affected them more than previously thought. Make sure you click here and like us on Facebook or follow us on Twitter @Dbl_Coverage for the latest updates!